KYBELLA® is a non-surgical, non-invasive, FDA-approved treatment that can minimize or eliminate a double chin. This new, amazing injectable product helps better define the appearance of your jawline for a slimmer, younger look. It may also improve your self-esteem and give you more confidence in your appearance. The KYBELLA® treatment is a series of injections that eliminates the fat areas under your chin. KYBELLA® dissolves fat. There is no surgery involved, no incisions, and no stitches. It is not a temporary procedure that needs to be repeated; once the fat cells are gone, they are gone for good. This makes KYBELLA® a great remedy for a double chin or early jowls. When Raleigh and Cary patients come in for KYBELLA® treatments, they will receive multiple targeted injections at each appointment. For the best results, Dr. Zenn recommends an average of three to four treatment sessions, each spaced at least one month apart. The treatment is an hour long, and many patients return to work the same day. In general, patients notice improved tightness and contouring of the neck with each successive treatment. Because the change happens gradually, before and after photos are a great way to see the differences KYBELLA® can make. It is unreasonable to expect that a single treatment will deliver a beautiful final result. Is KYBELLA® a Good Choice for Me? When patients in the Raleigh and Cary area have consolidated fat deposits with fullness under the chin, they may be a good candidate for KYBELLA®. While this treatment doesn’t address sagging or loose skin by itself, it does help skin tighten when there is underlying fat in the same area. Dr. Zenn will examine your neck before the procedure to make sure that KYBELLA® is the right choice to improve your profile and neck contour. When you come in for your consultation, you will receive a treatment recommendation, including the number of treatments needed to best achieve your desired appearance and profile. Dr. Zenn will explain what to expect in the days following treatment (mild bruising or swelling) and will answer all of your plastic surgery related questions. Dr. Zenn has found that some Raleigh and cary patients who schedule a consultation for facelift or neck lift surgery are often better candidates for KYBELLA® treatments. In other patients, there is just too much extra skin for KYBELLA® treatments to deliver optimal results. In those cases, surgery may be a better option. Because Dr. Zenn is an expert in facial anatomy and has years of experience using injectable products and performing state-of-the-art facial surgery, he is uniquely qualified to help you consider ALL options before choosing a treatment plan. Our patients often combine their KYBELLA® treatment with other injectables such as BOTOX® or fillers. We want you to understand your options, be comfortable with your choice of treatment and be confident in your choice of plastic surgeon. Dr. Zenn creates a personalized treatment plan based on your unique neck, chin and jawline profile. At each treatment, you will be given multiple small injections under your chin. The average patient needs 3-4 treatments one month apart for optimal results. 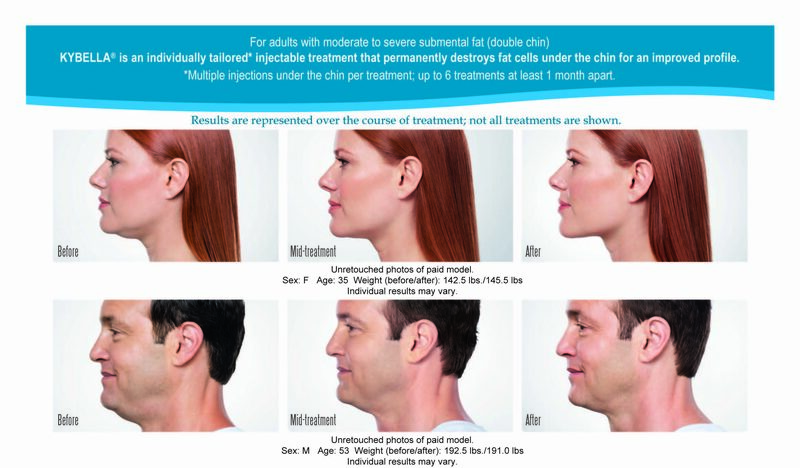 Results for each patient depend on the profile of his or her neck and the amount of excess fat under the chin. KYBELLA® takes time to work; most people begin to see results three to four weeks following injections. As the series of KYBELLA® treatments progress, results are increasingly visible. Like other injectable treatments, people who try KYBELLA® may experience some discomfort immediately following the injections. This tends to resolve quickly. Raleigh and Cary patients may also have bruising and swelling in the area for a few days, but this is a normal part of the healing process and KYBELLA®’s active fat destruction. What About the Safety and Effectiveness of KYBELLA®? KYBELLA®’s safety and effectiveness were firmly established in multiple large studies involving more than 1,000 patients. Those who received KYBELLA® treatments saw more frequent reductions in fat and improved appearance of the jawline. In fact, 79 percent of people treated with KYBELLA® in the study were satisfied with the appearance of their chin and neck after completing the treatment. Raleigh and Cary patients report feeling younger and happier and in general feel less embarrassed and self-conscious. KYBELLA® is an FDA-approved treatment that is proven to work safely. If you have a double chin or a large area of fat in your neck, KYBELLA® may be the perfect choice for you. Call Zenn Plastic Surgery to schedule a consultation with Dr. Zenn. If he determines that you are a good candidate for KYBELLA®, your treatments can begin the same day as your appointment. It is economical to purchase your treatments in advance as Zenn Plastic Surgery discounts the product when four or more treatments will be required. Schedule a KYBELLA® consultation with Dr. Zenn by calling his office in the Raleigh and Cary area at (919) 480-3885.